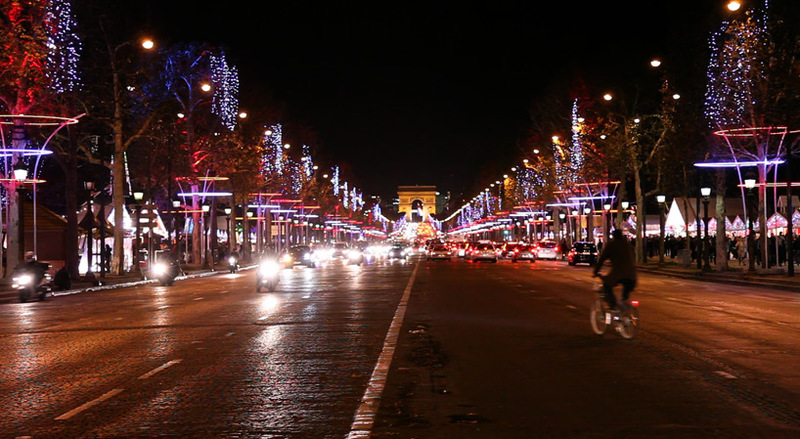 a four year tradition for the famous parisian avenue champs-elysée continues this year by illuminating the rows of trees leading to the arc de triomphe with a display of ‘tree rings’ designed by brussels-based ACT lighting design. led by koert vermeulen & marcos vinals bassols, the team installed three hoops upon each of the 200 trees along the avenue. illuminated with a strip of LED lights, the display represents the gathering of unity between people and nature. bright colors radiate through diverse sequences at different hours of the night and on specific winter holidays including christmas and new years. seven meters above the ground, a curtain of twinkling lights produces another layer of background lighting. solar energy from a photovoltaic farm supplies the LEDs, reducing overall consumption by 90% since the initiative began in 2006.